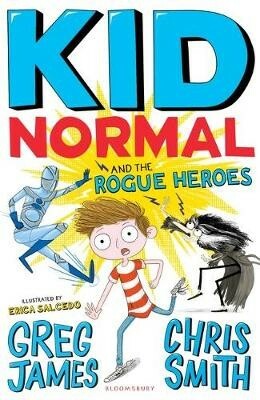 The sequel to the epically funny adventure, Kid Normal, shortlisted for the Waterstones Children's Book Prize 2018, starring Murph Cooper and the Super Zeroes from authors Greg James and Chris Smith. Running a team of crime-fighting superheroes is a complicated business - especially when your mum's not allowed to know that you're doing it. But Murph Cooper is making it work: he's a schoolkid by day and a member of the top-secret Heroes' Alliance by night. Far away in a maximum security prison, the world's most notorious supervillain, Magpie, has just broken a 30-year silence. British BBC Radio 1 DJ’s Greg James and Chris Smith came up with the idea of writing a book together after they started inventing characters as part of their weekly podcast. Having had great fun coming up with fantastic characters such as the Butter Monster (and his seasonal partner in crime the Brandy Butter Monster) they decided to turn their ideas into a book and together wrote Kid Normal. We follow Murph, Hilda, Nellie, Mary and Billy in the continuing adventures of the Super Zeroes against an even greater danger than that wasp guy, you know the one.